Golden Tate of the Detroit Lions scores in the fourth quarter against the New Orleans Saints at Ford Field on Oct. 19 in Detroit. NFL Playoff Implications, our weekly guide to what games matter, and whom they matter to, returns for Week 10 of the NFL season. For an explanation of the methodology, see here. UPDATE (Nov. 8, 11:36 a.m.): The interactive tables above have been updated to include the result of Thursday night’s CLE-CIN match-up, and that game has been removed (the text of the article has not been updated). Previous versions of our Playoff Implications treated the playoffs as a binary, yes/no proposition. Games were assessed according to their impact on a team’s overall playoff chances, irrespective of the team’s seed. But in the NFL, a team’s playoff seed is important, and it counts for far more than just bragging rights (more on that below). So, with that in mind, we’ve added some additional interactivity this week. Like last week’s Philadelphia Eagles-Houston Texans matchup, this Sunday’s game between the Miami Dolphins and the Detroit Lions is positively riddled with playoff implications. In the AFC, the Dolphins are a wild card contender, coming off a 37-0 curb-stomping of the San Diego Chargers. The Dolphins’ playoff chances are at 46 percent going into Week 10. A win over the Lions would boost that number to nearly 60 percent. 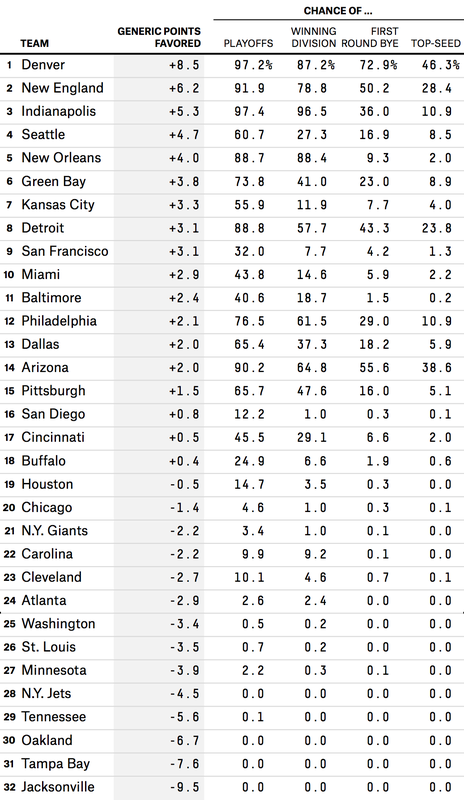 That 14 percentage-point bump comes at the expense of 10 of their AFC conference rivals. A Dolphins’ victory would also bring them within a game of the idle New England Patriots and increase their division title chances to 20 percent. The Chargers, meanwhile, are in free fall. Their playoff probability was a solid 76 percent going into Week 7. But with consecutive losses to the Kansas City Chiefs, Denver Broncos and Dolphins, they find themselves with just a 12 percent shot at making the playoffs. In the NFC, the Lions are dueling with the Arizona Cardinals for the top playoff seed (pause for a moment to let that sink in). A win over the Dolphins would increase Detroit’s top seed chances by 6 percentage points. If combined with a loss by Arizona to the St. Louis Rams, the Lions could find themselves as the new NFC front-runner going into Week 11. The Eagles, at 6-2, are also legitimate contenders for the top seed, but they have a few strikes against them. For one, their Week 8 loss to the Cardinals means they lose any tiebreakers to Arizona should they finish with the same record. In addition, the Eagles’ other loss was in-conference, and conference record is the second tiebreaker applied after head-to-head. Finally, while not a death sentence by any means, the Eagles will be relying on the passing efficiency of Mark Sanchez while Nick Foles recovers from a collarbone injury. It is clear that the first-round bye is the most important factor in determining a team’s likelihood of reaching the Super Bowl. Home-field advantage is important, but it is still just that — an advantage (about 60 percent for evenly matched teams). A first-round bye, on the other hand, is a guarantee — a guarantee that a team will survive the first week of the playoffs. It is tantamount to a free victory. In Week 10, the Broncos are most at risk of ceding this crucial advantage to one of their AFC competitors. Their game against the Oakland Raiders features a 25 percent swing in first-round bye probability. Last week, the Broncos could have solidified their status as the top AFC seed with a victory over the Patriots. Instead, their loss opened up the door for New England and the Indianapolis Colts. A loss to Oakland would open that door even wider, giving the Pittsburgh Steelers, Cincinnati Bengals and Chiefs all a chance at that free first-round victory. Other games of note include Kansas City visiting the Buffalo Bills, which will have huge playoff implications for the two participants (the rest of the AFC is mostly indifferent). But when the San Francisco 49ers visit the Saints in New Orleans, every NFC team save two (Washington and Tampa Bay) will have a vested interest in the outcome. For reference, we have also included the ranking table used for the simulations (the rankings are based on point spreads). Generic Points Favored is what one would expect a team to be favored by against a league average opponent on a neutral field. 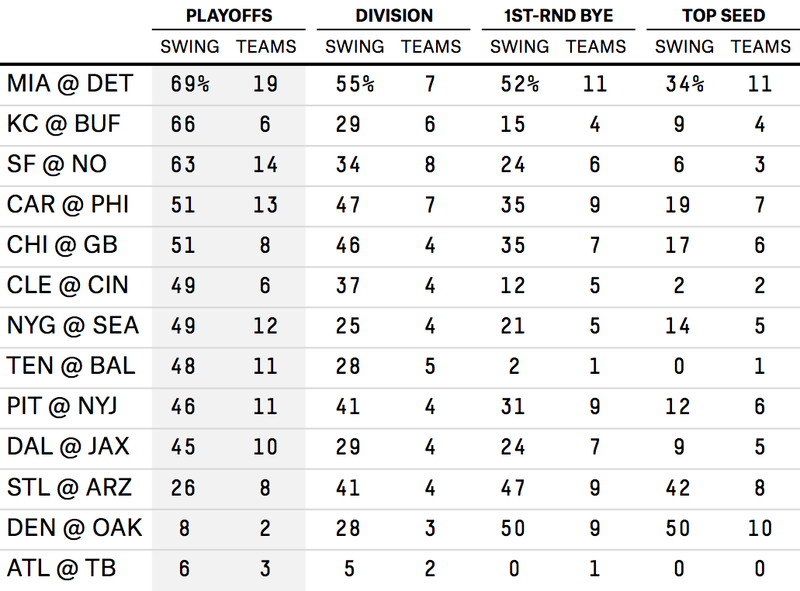 Refer to “The Importance of Playoff Seeding” at Advanced Football Analytics for further details on the calculation of the NFL seed probabilities. For the NBA analysis, we assumed that playoff home-court advantage was worth 4.5 points, which is equivalent to a single-game win probability of 67 percent (for evenly matched teams). For a best-of-seven series, the resulting series win-probability is 56 percent. I assumed that the better playoff seed would also have home-court advantage. This will not always be the case, but it seemed like a safe assumption for simplifying the analysis.